NF-kB is a short name of Nuclear Factor kappa-light-chain-enhancer of activated B cells. It is not a single protein, but a small family of inducible transcription factors that play an important role in almost all mammalian cells. It control DNA transcription, cytokine production, cell survival and other important cell events, especially play a key role in regulating the immune response to infection. NF-kB molecular are usually dimers. A typical structure of NF-kB is P50-P65 dimer (NF-kB1/RelA). The dimer formation is necessary for DNA binding, two NF-κB monomers bind to DNA as a dimer. The N-terminal regions of dimer are responsible for specific DNA contact. The C-terminal regions are usually highly conserved, they are responsible for dimerization and nonspecific DNA phosphate contact. The whole NF-kB molecular is just like a pliers vise on the DNA chain and function as a transcription factor (figure 2). Figure 2. The structure of NF-kB protein dimer binding with DNA chain. Because NF-κB family members share structural homology with the retroviral oncoprotein v-Rel. so they also called NF-kB/Rel Proteins. The NF-kB transcription factor family in mammals consists of 5 proteins: p65/RelA, RelB, c-Rel, p105/p50 (NF-kB1), and p100/p52 (NF-kB2). These 5 proteins associate with each other and form distinct transcriptionally active homo/heterodimeric complexes (Figure 3). They all share a common conserved Rel homology domain (RHD) of 300 aa length. These RHD domain have multiple functions such as dimerization, DNA binding, interaction with IkBs, and nuclear translocation. Although the NF-kB protein family members can form up to 15 different dimers, but many of them has not yet demonstrated. The most abundant form of NF-kB dimer is p50/p65 heterodimer which has been fund in almost all cell types. As only P65/Rel, RelB and c-Rel have carboxy-terminal transactivation domains (TAD), the NF-kB family of proteins can be further divided into two groups. p50 and p52 are generated by processing of the precursor molecules p105 and p100, respectively. Therefore, not all combinations of Rel dimers are transcriptionally active. Figure 3. The 5 protein and their homo/heterodimeric complexes of NF-kB family. NF-kB protein dimmers as nuclear transcription factor, they need to migrate to the nucleus, combined with DNA to have function. In most types of the normal cells under resting state, NF-KB was inactive and retain in the cytoplasm. They binding to a specific inhibitors called IK-B protein, which could bind to the Rel homology domain (RHD) of NF-kB and interfere with its nuclear localization sequence (NLS) function. These inhibitor proteins, which include IkBa, IkBb and IkBg, contain 6–7 ankyrin repeats that mediate binding to the RHD. These repeats are also present in the C-terminal halves of the NF-kB2/p100 and NF-kB1/p105 precursors, which also function as IkBs and retain their partners, the Rel proteins, in the cytoplasm. In order to activate the NF-kB molecular, the cells first need to separate the NF-kB protein from their inhibitors. There are two major signaling pathways lead to the IK-B protein inhibitor dissociation from NF-kB dimmer and let the translocation of NF-kB dimers from the cytoplasm into the nucleus. Canonical or classical cascade signaling starting from the cell surface receptor of pro-inflammatory cytokines and pathogen-associated molecular patterns (PAMPs) such as the tumor necrosis factor receptor (TNFR), toll-like receptor (TLR) and T/B cell receptor. These receptors binding with their ligand molecules and transfer the signal across the cell membrane, cause the activation of the IkB kinase (IKK) complex. The most common form of this complex consist heterodimer of IKKα and IKKβ catalytic subunits and an IKKγ regulatory subunit. The IKKγ unit also called NEMO for NF-kB essential modulator. The activated IKK complex, predominantly acting through IKKβ in an IKKγ-dependent manner, catalyzes the phosphorylation of IkBs (at sites equivalent to Ser32 and Ser36 of IkBa), polyubiquitination (at sites equivalent to Lys21 and Lys22 of IkBa) and subsequent degradation by the 26S proteasome. The released NF-kB dimers (most commonly the p50–RelA dimer), translocate to the nucleus, bind DNA and activate the down-stream gene transcription. Another NF-kB activating pathway called no-canonical or alternative pathway. This pathway is independent of IKKβ and IKKγ, but dependent on IKKα dimmer instead. The signaling transfer into the cytoplasm through the LT-β or BAFF receptor. Phosphonate a NIK protein, NIK protein then phosphonate the IKKα homodimmers. The target for IKKα homodimers in this pathway is NF-kB2/p100, which is phosphorylated at two C-terminal sites. Phosphorylation of these sites is essential for p100 processing to p52, which is also dependent on polyubiquitination and proteasomal degradation. However, instead of leading to complete p100 degradation, as seen with IkBs, the phosphorylation-dependent ubiquitination of p100 results only in degradation of its inhibitory C-terminal half parts. Once the C-terminal half is degraded, the N-terminal portion of NF-kB (the p52 polypeptide that contains the RHD) is released. As the RHD of p100 is most commonly associated with RelB, activation of this ‘alternative’ pathway results in nuclear translocation of p52–RelB dimers. The dimer finally bind to DNA and active the down-stream gene transcription. Ubiquitin is a 76-amino-acid protein that is highly conserved and ubiquitously expressed in all eukaryotes from yeast to human. The carboxylic acid in the C-terminal glycine of ubiquitin can be covalently attached to the epsilon amine of lysine on another protein through an isopeptide bond. This process is called “ubiquitination”. Moreover, the C-terminal tail of ubiquitin can be directly attached to the N-terminal methionine of another ubiquitin to form linear polyubiquitin chain. Ubiquitination plays an essential role in the regulation of NF-kB pathways. In unstimulated cells, NF-kB binds to inhibitory proteins of kB family (IkB) and is sequestered in the cytoplasm. Upon stimulation, IkB is phosphorylated by the IkB kinase (IKK) complex, Phosphorylated IkB is subsequently ubiquitinated and degraded by 26S proteasome, thus allowing NF-kB to translocate to the nucleus, where it regulates the expression of a plethora of genes. As the regulatory subunit of the IKK complex, NEMO has been proposed to be the key factor for transducing ubiquitination signal to IKK activation. Several DUBs function as key negative regulators of IKK to allow a tight control of NF-kB activation. One of the best studied DUBs is A20, It has been proposed that A20 suppress hyperactivation of NFkB by deubiquitinating K63-linked polyubiquitin attached to RIP1 through the N-terminal OTU domain, as well as promoting K48-linked polyubiquitination of RIP1 for proteasomal degradation. NF-kB acts as a central mediator of immune and inflammatory responses, and is involved in stress responses and regulation of cell proliferation and apoptosis. The respective NF-kB target genes allow the organism to respond effectively to these environmental changes. 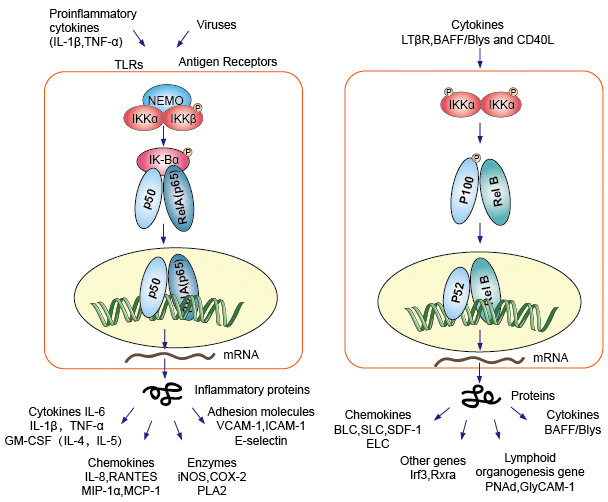 The classical NF-kB pathway is activated by a variety of inflammatory signals, resulting in coordinate expression of multiple inflammatory and innate immune genes. The proinflammatory cytokines IL-1b and TNF-a activate NF-kB, and their expression is induced in response to NF-kB activation, thus forming an amplifying feed forward loop. The alternative pathway for NF-kB results in nuclear translocation of p52–RelB dimers, is strictly dependent on IKKa homodimers and is activated by LTbR, BAFF and CD40L by NIK. Many data strongly suggest that the alternative pathway plays a central role in the expression of genes involved in development and maintenance of secondary lymphoid organs. The transcription factors of the NF-kB family control the expression of a large number of target genes in response to changes in the environment, thereby helping to orchestrate inflammatory and immune responses. Figure 4. Down-stream signaling of NF-kB signaling pathway. The inflammatory basis of metabolic diseases. The IKK/NF-kB signaling pathway is key to the linking of metabolism, inflammation, and insulin action. Most of the metabolic stress signals resulting in insulin resistance or pancreatic β cell dysfunction, whether induced by intracellular or extracellular cues, converge on the NF-kB-activating kinase IKKb and other major inflammatory kinase, JNK-mitogen activated protein kinase (MAPK). Glycolysis can generate ATP in greater quantities and at a faster rate than oxidative phosphorylation. Glucose is therefore an essential nutrient for cancer and normal proliferating cells. NF-kB coordinates many of the signals that drive cell activation and proliferation during immunity, inflammation, and oncogenesis. 1. Oeckinghaus A, Ghosh S. The NF-κB family of transcription factors and its regulation[J]. Cold Spring Harbor perspectives in biology, 2009, 1(4): a000034. 2. Bonizzi G, Karin M. The two NF-κB activation pathways and their role in innate and adaptive immunity[J]. Trends in immunology, 2004, 25(6): 280-288. 3. Chen F E, Huang D B, Chen Y Q, et al. Crystal structure of p50/p65 heterodimer of transcription factor NF-κB bound to DNA[J]. Nature, 1998, 391(6665): 410-413. 4. Chen J, Chen Z J. Regulation of NF-κB by ubiquitination[J]. Current opinion in immunology, 2013, 25(1): 4-12. 5. Tornatore L, Thotakura A K, Bennett J, et al. The nuclear factor kappa B signaling pathway: integrating metabolism with inflammation[J]. Trends in cell biology, 2012, 22(11): 557-566.